This is a consumer-reference feedback and feasibility testing of a protocol to obtain qualitative responses of co-residing caregivers to questions regarding the timing of dementia diagnosis and their experience of the disclosure of a diagnosis of dementia. Data collection involved focus group discussions and individual phone interviews of a convenience sample (N = 5) of an Alzheimer’s Australia state based Consumer Advisory Committee. Thematic analysis utilised the Leximancer software. Consumer feedback suggested a reordering of the interview questions and reversing the data collection sequence to reduce the emotional impact on participants. Suggestions were offered to limit the number of participants in the focus group to shorten the duration of the focus group session to prevent fatigue and to provide a support person to improve participant focus group comfort. Responses to the interview questions indicated caregivers retrospectively considered a timely diagnosis would have provided useful dementia-focused planning, reduced the difficulties of living with uncertainty and would have provided more time to obtain information and support. There were strong expectations for medical practitioners to be sensitive to the possibility of dementia and to be cognisant of the diagnostic concerns of caregivers. 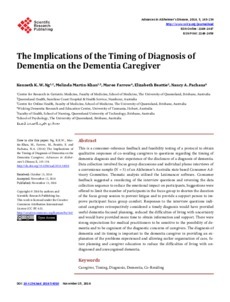 The diagnosis of dementia and its timing is important to the dementia caregiver in providing an explanation of the problems experienced and allowing earlier organisation of care, future planning and caregiver education to reduce the difficulties of living with undiagnosed and unrecognised dementia.